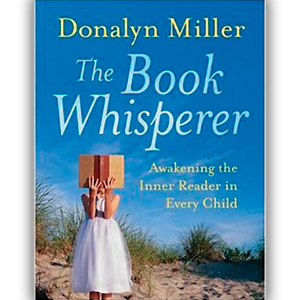 Therefore, teacher Donalyn Miller set out to awaken the inner reader in every child that entered her classroom. Her approach is nontraditional, especially in our test-crazed age. However, Miller claims her students not only read over forty books a year but an average of 85 percent of her students score in the 90th percentile on the state reading assessment. What does this have to do with parenting? Well, as Miller identifies the weaknesses in school reading programs, she illuminates the mistakes of well-intentioned parents as well. Whether it’s trying to get their children to read the books they want them to or failing to model what it means to be a life-long reader, there’s much for parents to take-away from The Book Whisperer. Miller believes that building lifelong readers begins with “encounters with great books, heartfelt recommendations, and a community of readers who share this passion.” Success in reading, therefore, has to do with creating the conditions for learning. Immersion – Kids need to be surrounded by books. All genres. All reading levels. I’m always surprised when I go into homes of parents, who are eager to raise readers, yet there isn’t a book in sight. Their kids’ bookshelves have a collection of picture books they outgrew years ago and a handful of books they’ve since acquired at school book fairs. This just isn’t enough to create a word-rich environment. Now I’ll be the first to admit I don’t buy many new books, but we frequent used books stores and make regular trips to the library. I have five library cards for all the surrounding counties. If there’s a book we want, one of them will have it. Demonstration – Miller believes children need ample examples of how to use texts to meet their needs. It’s up to parents to model how books play a role in the different aspects of their lives. I’m always amazed when parents tell me how they are always telling their kids they need to read yet when I ask parents what book they’re reading the parents say they don’t have time. In addition to the monthly title I read for Parenting by the Book, I read every night and listen to books during my daily commute so there’s never any doubt in my children’s minds that I value reading. Expectations – Miller sets high annual goals for her students because she says it forces them to always have a book they are reading. This past year, I set the goal of reading 50 books and my twelve year old set the goal of reading 35. At the time of writing this blog, I am two books away from my goal and she is five from hers. While I didn’t require her to read a variety of genres, as Miller does, I did keep tabs on her progress and praised her as she moved closer to reaching her goal. Responsibility – Miller believes kids need to choose books that interest them and schools (parents) need to resist the temptation to pressure children into reading books what they believe to be better “quality” book. The important thing is that children are reading and developing a love of reading. While I read a lot of books, my daughter has different interests than me so sometimes I struggle to recommend titles when she’s wrapped up a favorite series and is looking for something else. I let her join Goodreads, which is a “social cataloguing” website that allows members to rate books and receive recommendations. My daughter and I not only keep track of books we’ve read but also those we want to read. It’s revolutionized my reading life. Employment – Children need time to read. Sadly, the busier our lives get the less likely we are to make time for books. My kids keep books on their nightstands, in their backpacks, and the backseat of the car. Something to read is always close by. At the very least, they read before bed. Response – Since the world is our classroom, parents have to capitalize on opportunities to provide encouragement during daily conversations. I still read aloud to my kids – ages 8 and 12 – for exactly this reason. Books give us the means to discuss all kinds of topics. We recently finished reading Number the Stars by Lois Lowry during our Thanksgiving road trip. When I reached the Afterword and read an excerpt from a letter by a Danish Resistance leader during World War II, my husband heard the quiver in my voice and asked, “Are you crying?” Of course, I was, and I didn’t need to look into the backseat to know my children were emotional, too. Engagement – When it comes down to it, I want my children to know books move me. As Miller points out, “Reading unlocks worlds unknown or forgotten, taking travelers around the world and through time.” I want reading to be something worth doing well. According to Miller, she is often confronted by people claiming she isn’t preparing students for the real world, and she agrees, “It’s true, if the real world means years of comprehension worksheets and test practice.” But those of us who love the printed word know that the purpose of school is to “embrace reading as a lifelong pursuit,” as Miller claims. Miller believes, and as an English educator of 22 years I couldn’t agree more, that “Readers are made, not born.” Therefore, Miller argues children need a balance between teaching literature and facilitating their growth as life-long readers. Since I’m not calling the shots at my kids’ schools, I try to make reading as enjoyable as it can be at home. Sure, my kids will get a couple of books this holiday, but my real gift to them is making reading part of our daily lives. While it can’t be wrapped up and put under a tree, it doesn’t mean it isn’t something they’ll cherish.